They drank a bottle of Oregon Pinot together on their very first date. Subsequently they tasted wines all over California, and in 2009 moved to France where Kate translated (of course she speaks French!) and where an enologist friend of a friend gave them an intensive, hands-on winemaking education in Beaujolais. When they weren’t learning how to make wine in Beaujolais, they went south to taste in the northern Rhône, and north to taste along the Côte d’Or. Oh, and they lived for a while in Kate’s family house in the Loire, where they also made wine. So they drank a lot of local juicy low-alc vin de soif made of Gamay, Cab Franc, various Pinots, Sauvignons, Chenins, Chards (the Loire has it all, even Malbec or Cot, a grape that by all reckoning ought to be a failure so far north and, indeed, usually is—but sometimes it’s not; sometimes, it’s really good, even when it grabs you by the throat). Tom is from St Louis. That explains why he loves to ski. Also, he loves rock bands and live music, and that explains why he went to business school. B school was in the Bay Area, which may explain why he wrote a business plan for a winery based in Oregon. Then he went to work for a big bank. Kate is from England, Switzerland, France, and America. She has been all over the world and ended up in college in upstate New York. She smells wine like nobody else (probably better than Tom). She tastes like a pro (probably better than Tom, which kills him). She has an eye for design (check out those nifty Division labels). From the Bay Area, they moved to NYC, and Tom continued with the suit and ties and corporate finance. One day, pretty early on in NYC, Kate said, What’s with the big bank? Tom shrugged, and in his heart of hearts he totally agreed, so he quit the big bank. They got themselves a black dog and took off to France (with the dog) to learn to make wine! After it was all said and done, they figured Oregon was the place to be, and there they went. Kate got a job managing affairs for Penner-Ash Cellars while Tom landed a job working alongside the winemaker at the Methven Family Vineyards. In 2011 he went back to France to help out with a couple of harvests, most notably with Domaine Nudant in Corton; afterward, he raced back to Oregon to do the same. Tom wrote another business plan. 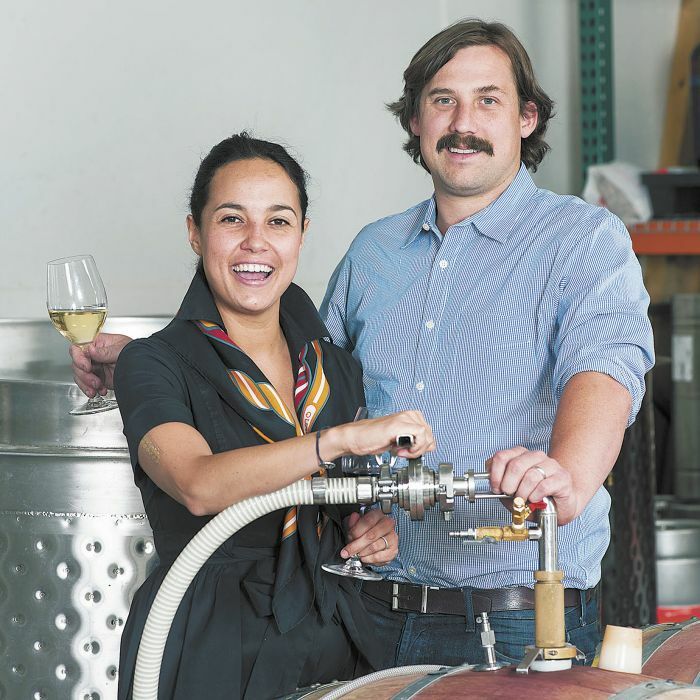 They got some cash from a family member, and in 2012 Kate and Tom founded the SE Wine Collective in Portland. See? This was what happened when that boy met that girl: they became commie winemakers! Except that’s simplistic. What they did was really smart. They built a winery, got three other brands to invest and make wine and share ideas and expenses under the same roof; they got a retail license to sell their wine on site; plus they got a bar license to serve their wine on site. So now they can do what they want and pay their bills. They make a bevy of wine in small batches. Fifty cases here, seventy-five there, and so on. There are two tiers: Division Cru and Division Villages. Cru is for the more age-worthy wines; Villages is for those wines inspired by the vibrant vins de soif of the Loire. The hallmark of all of their wines is their lovely, pure aromatics. That, and their sheer drinkability and ease, for these wines are nothing if not comfortable in their own skin. Gamay A Villages wine Inspired by the rosés Tom and Kate drank in northern France; l’Avoiron is the name of the volcano near the vineyard where Tom and Kate worked in Auvergne. Grapes come from same Yakima vineyard in Washington as their Chenin Blanc. Gamay Noir “Les Petits Fers” Gamay A Villages wine AKA 'the little irons'. From a vineyard in Umpqua and another in Eola-Amity Hills, semi-carbonic fermentations, aged in neutral barrels. Chenin Blanc A Villages wine. 'The green island', referring to rather unique old vines planted in 1979 and growing in Yakima Valley. Native yeast ferment, aged sur lie in neutral barrels. Pinot Noir A Villages wine. Eola-Amity Hills fruit, native yeast ferments, whole cluster, raised in cement. Pinot Noir A Cru wine mostly from a block of Methven Family Vineyards farmed for high yields for rosé; direct pressing, raised both in tank and in neutral barrel. Mostly Gamay Noir with some Pinot A Cru wine harvested on the early side, meant as a true harvest wine, one of merriment and celebration. Chardonnay Chardonnay A Cru wine. Native yeast, full malo yet retaining excellent freshness, raised in barrel and steel. 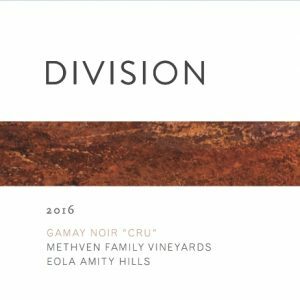 Gamay Noir Gamay A Cru wine. Methven Family Vineyards in Eola-Amity Hills, mostly traditionally fermented (de-stemmed, exposed to air), aged in neutral barrels. Pinot Noir “Un” Pinot Noir A Cru wine. Several vineyard sources, traditional fermentations, aged in oak (small percentage new barrels). Pinot Noir “Deux” Vieilles Vignes Pinot Noir A Cru wine. Vines (Pommard clone) planted in 1973 in Eola-Amity Hills; raised in new and old barrels. Their most age-worthy Pinot. Cabernet Franc “Mae’s Vineyard”: Cabernet Franc A Cru wine. From the Applegate Valley in southern Oregon. Planted on a bedrock of granite. Traditional ferment, aging in neutral barrels.